A film that people will talk about for years. Get in before it gets away. There’s a story somewhere about a woman who sued the distributors of this film for representing it like Fast & Furious and when it turned out to be something else she left disappointed enough to sue them. I can only hope they countersue and then instead of getting money, they take her eyes instead, or just take her out back and shoot her like a dog, because this has become one of my favourite movies of all time. For those who don’t know, Gosling plays a stunt car driver for the movies who works in a garage in the day and is a getaway driver at night. “What do you do?” “I drive.” Once he bumps into his neighbour played by Carey Mulligan (a bit different from the Hispanic in the book) and her young son, he seems to take a liking to them. When the Dad comes back from prison, Gosling gets caught up in a situation he doesn’t want to be in. This is a film that not only resonates with women, but is for the modern man. Gosling takes care of himself, he doesn’t smoke but instead chews on toothpicks, he’s well groomed, moves as smooth as a snake – almost effeminately and isn’t loutish. He’s the strong, silent type and without a name, (he must say about fifty words the whole 90 minutes) and it draws comparisons with the Western genre, amongst obvious others. However, amongst all his charming ways and boyish good looks lies a sinister, animalistic dark side. It’s that anger, frustration and sheer balls that lies behind every man – the need to do anything to protect the weak, the violent streak that we keep under control. What turns from an interesting love story goes to a Tarantino-like gangster caper but on a much smarter scale. 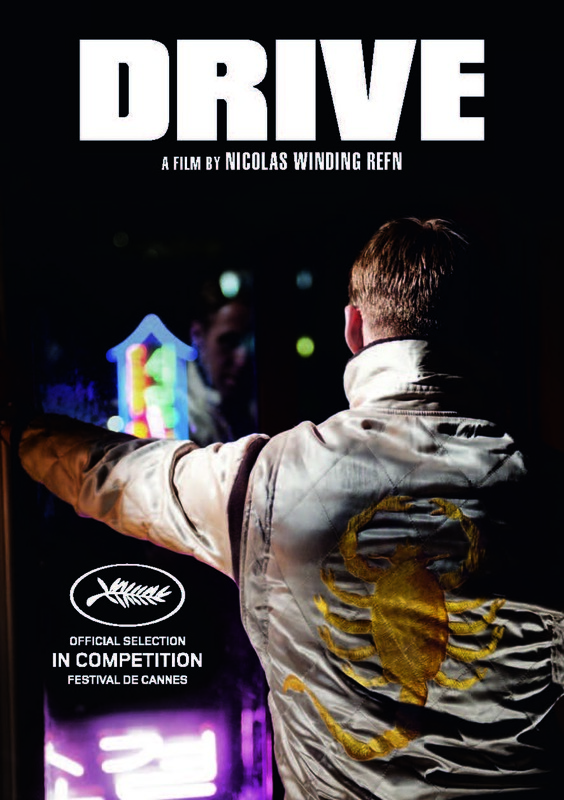 My initial thought was this was going to be like one of my favourite films from the Seventies called, funnily enough, Driver starring Ryan O’Neal and one of my favourite actors Bruce Dern. O’Neal playing a getaway driver who hates guns, who uses a car like it’s attached as a limb. Drive shares these same values. Gosling handles a car like it’s a walk down the street, he never needs to say much and oozes cool. He’s the classic Noir anti-hero, blurred moral lines but a passion to do what’s right. His conversation with the kid about sharks and knowing who the bad guy is sums his character up perfectly, just because someone seems bad and does bad things, does it make him a bad person? Aren’t we all similar in that respect? We might not be kicking someone’s face in to death in a lift, but then isn’t it out of protection in any case? The scorpion on his back is a very apt simple, a symbol of evil and yet protection as well as a strong sexual image, an isolated creature that is deadly yet, when used for medicinal purposes, can also heal. It’s an animal of contradictions, much like Gosling. Even his violent behaviour is like a scorpion, quick, sharp and with a sting. We don’t know anything about the man, and neither do we need to, Gosling is able to provide such an atmosphere on screen that it keeps us on the edge of our seats. That’s not to take away from the peripheral characters, Carey Mulligan does an amazing job as doe-eyed, hard-working mum Irene and Bryan Cranston impresses as Shannon (though it reminded me a little too much of his character in Breaking Bad), but this is essentially Gosling’s film, he eats up every scene like this was the role he was born for. There’s no wasted dialogue, no scenes that don’t work to the films favour and the story moves at a perfect pace. The directing is beyond amazing. Refn paints the city in a beautiful light that would make even the likes of Michael Mann stand up and pay attention. His use of lighting, the texture of his shots, the depth and action scenes are expertly done, it’s editing is unique and exciting and the soundtrack is mind-blowing. It gives the film an eighties, Blade Runner feel to it’s modern day setting and every frame is like a picture. I only really knew Refn from Bronson, a film I thoroughly enjoyed and that introduced me to Tom Hardy, and the poorly received Valhalla Rising. However, his boldness itself to create atmosphere, chilling or otherwise is exceptional. What also helps this is the score, a magnificent piece of work by Cliff Martinez and Bronson collaborator Johnny Jewel. The music has a French cool about it with a sinister undertone and at times a breathy female vocal that is transcending. It’s not very often do I sit and listen to an entire score, proving how worth your time it is to listen to regardless of the film. Some scenes which would play out nicely in other films, such as when they are all eating diner together, have a sinister undercurrent dirge that plays throughout several scenes, invoking that evil side of Gosling that is hidden so well. It taps into your subconscious and plays with it. Overall, this film is startling in every way. If you haven’t seen it, then you’ll really miss not being involved in conversations about it until the end of cinema. It really is that good.